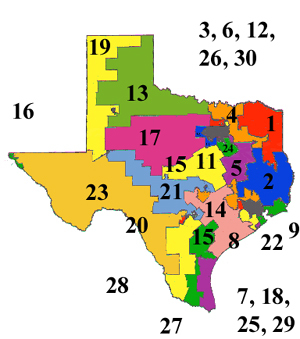 Find information on the Texas 2003 Redistricting plan. There is no congressional deadline. 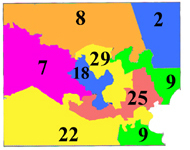 The state legislature failed to adopt legislative districts so a plan by the 5-member Legislative Redistricting Board was adopted on July 24, 2001. The legislature. The Senate Committee of the Whole on Legislative and Congressional Redistricting and the House Committee Redistricting are the committees that have jurisdiction. The governor has veto power over both congressional and state legislative plans. Open hearings are held around the state in order to give the public a chance to participate in redistricting. Citizens are also able to directly access computer systems through their legislators, in order to draw their own plans. In addition, the legislature has a redistricting site with maps, information about litigation, input, news, a timetable, and an email listserve. Democrats drew the most effective partisan gerrymander for congressional elections in the nation in 1991. The eight Republican incumbents were put into districts packed with Republican voters. These incumbents won overwhelmingly, but despite the fact that the statewide congressional vote was evenly split, Democrats won 21 of the remaining 22 seats -- including the three newly-created seats, each of which were filled by state legislators who had served on redistricting committees. Only one of thirty races was decided by a margin under 10% in 1992. But the state has trended Republican in the 1990's, with Republicans sweeping statewide elections and winning many down-ballot races, such as judicial elections. As Republicans have won larger majorities of the congressional vote, they have narrowed Democrats’ advantage in congressional seats to its current 17-13 edge and have taken over the state senate. The state gained two more seats in 2001. With Democrats only in control of half of the legislature, the next redistricting likely will result in a more neutral plan, which likely will be enough to reverse the Democrats’ current edge in House seats. During the 1997 regular session, the Texas Legislature passed S.B. 715, which enacted without change, the state senate districts approved in the 1995Thomas v. Bush settlement. That plan was subsequently used for the 1998 elections. Also enacted during the 1997 regular session were two bills affecting state house districts: House Bill 6 enacted the state house districts approved in the 1995 Thomas v. Bushsettlement, with additional minor changes to six districts, and H.B. 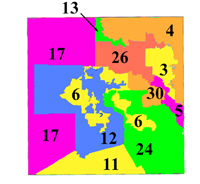 2254 made minor changes to eight other house districts. The U.S. Department of Justice precleared the changes, and the revised plans were used for the 1998 elections. On January 26, 1994, a suit was filed in federal court in Houston challenging the Texas congressional districts as unconstitutionally racially gerrymandered. In the summer of 1994, the court held three of the districts unconstitutional. The state appealed the case to the U.S. Supreme Court and proceeded to conduct the 1996 primaries under the state's plan. In June 1996, the Supreme Court upheld the district court's decision. The district court voided the results of the 1996 primary elections in 13 of the state's 30 congressional districts and ordered a special election to be held in those 13 districts on general election day using an interim plan drawn by the court. The district court gave the legislature until June 30, 1997, to enact a permanent plan, but the 75th Legislature did not adopt a plan within that time. On September 15, 1997, the court dismissed all pending motions and ordered the court-drawn plan into effect for the 1998 congressional elections. On January 25, 1995, Thomas v. Bushwas filed in federal court challenging 13 senate districts and 54 house districts as unconstitutionally racially gerrymandered. 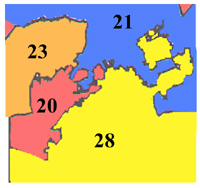 On September 15, 1995, the court ordered an agreed settlement under which: 1) eight senate districts and 36 house districts were changed; 2) the staggered senate terms drawn by lot in January 1994 were allowed to remain in effect; and 3) the one-year prior residency requirement was waived for the changed districts so that a candidate could run either in the same numbered district in which the candidate resided under the prior plan or in the new district in which the candidate resided.